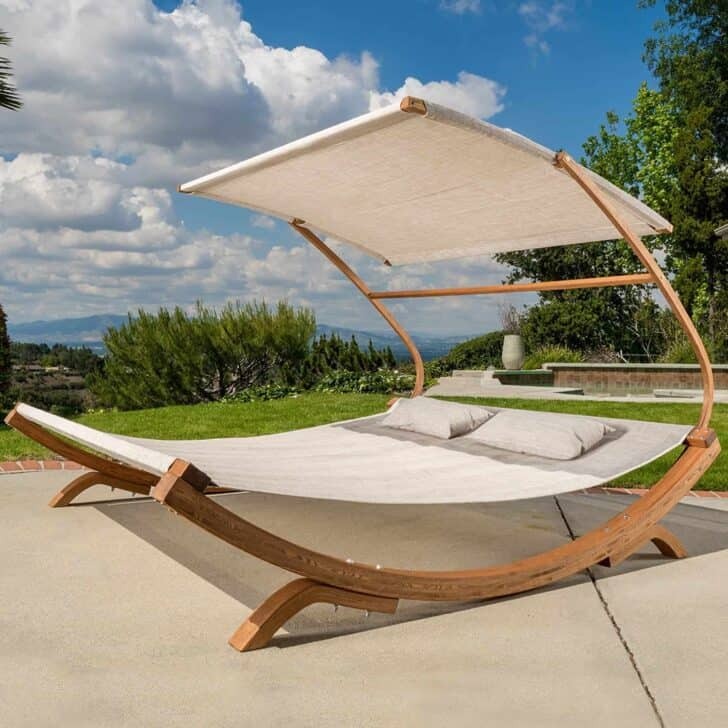 Outdoor Daybeds combine the pleasure of daydreaming (or sleeping!) in complete tranquility. Sometimes it is a pleasure of being in the sun and feeling the gentle summer breezes against our face. The desire to relax and have a peaceful moment is the driving force for the new must-have summer addition. Even the most doubtful are convinced when they see the ten daybeds we'll show you here. Summer is coming, so it is time to enjoy the heat, sun, and also take a well-deserved rest! Don't forget, on long summer days you get beautiful summer nights to enjoy a favorite beverage with that special someone while stargazing! Use these ideas to design an entire outdoor living area for day or night use! 4 - Use long-lasting materials: Madera Teak provides years of comfort! 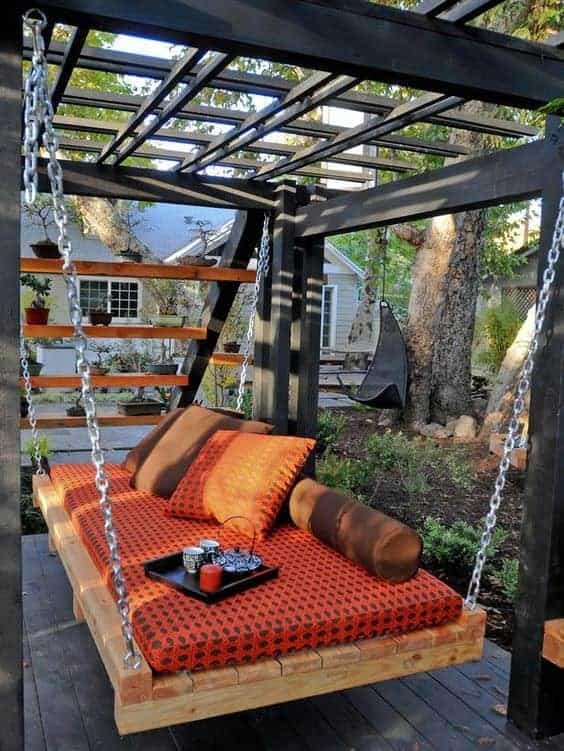 7 - Pergola and sturdy chains make lovely Outdoor Daybeds! View the tutorial here to learn how to make a grass-filled outdoor day bed! Create a simple or ornate frame to attach a shade cloth awning, add lots of fluffy pillows and a beautiful throw blanket. Your favorite beverage(s) of choice round out this elegant design. This Belham Living Brighton Daybed & Ottoman does this and more! Great inspiration for any outdoor living space! 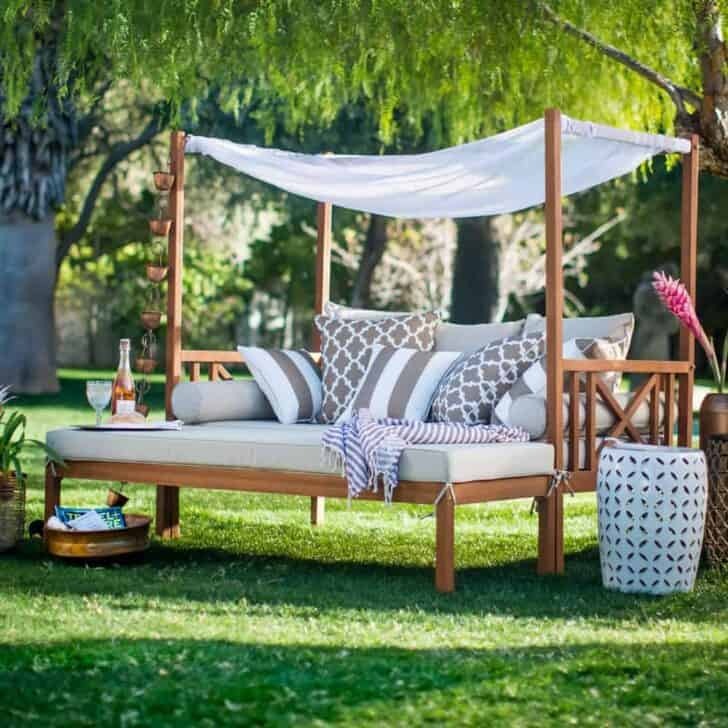 Stylish, functional and comfortable, these Outdoor Daybeds are available in a wide variety of shapes and styles and can be used even in the smallest spaces. 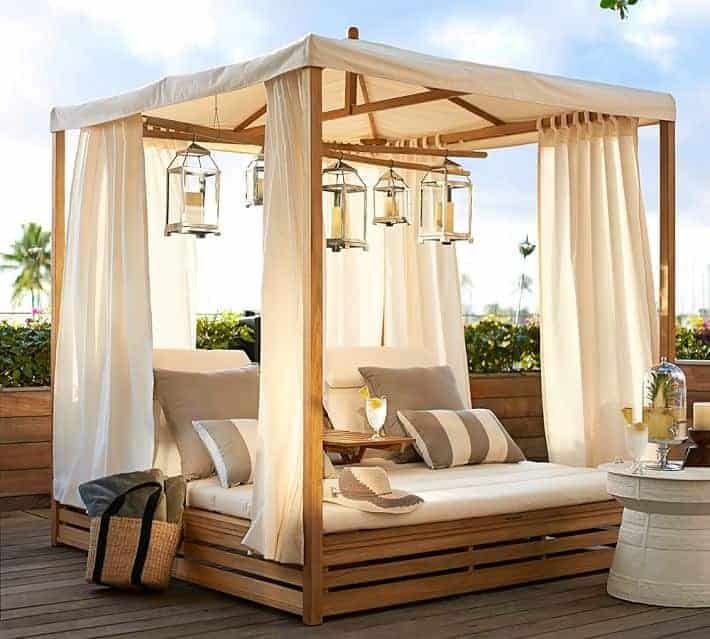 When you think of an outdoor bed, it is often the large four-poster beds that instantly come to mind. However, there are many other ingenious options offer a balance between good shape and function. Size is an essential factor in choosing an outdoor bed. Keep it simple: Outdoor Daybeds don't have to have a lot of drama. This minimalist modern lounger in Hawaii demonstrates this perfectly! Loungers and daybeds don't have to be big enough to hold the whole family, the pets, and the neighbors. They can be a place where you can escape for a breather, relax and read a book, or just take a break from the stresses of the day. This idea can be built with upcycled materials like pallets, too! This Hawaiian Minimalist Daybed demonstrates this perfectly! Contemporary retractable meridians or shades can be a solution for areas of your home with full sun exposure. You can even choose an outdoor hanging bed if you plan to put it on a shaded patio or pergola. Create an oasis for relaxation on the patio or garden. Made of premium Grade-A teak, a weather-resistant hardwood rich in natural oils, our Madera daybed is built to last for many seasons. The Corsica Twin Daybed. Image via Neoteric Luxury. This giant wicker furniture basket daybed invites the whole family to climb in and unplug from all the devices for a while. The Spartan Daybed is by Neoteric Luxury. Lounge chair, armchair or outdoor daybed? Make it whatever you want it to be! If you have space, there is nothing better than resting on a real bed, surrounded by a beautiful garden or under the blue sky attic. Creating a restful space, using waterproof/weather resistant materials, in a wide variety of shapes and designs mean you can have almost limitless options! You can buy double or single garden beds. Choose an igloo garden bed, to protect from the sun during the hottest hours, or garden canopy beds, to give an elegant Asian look. 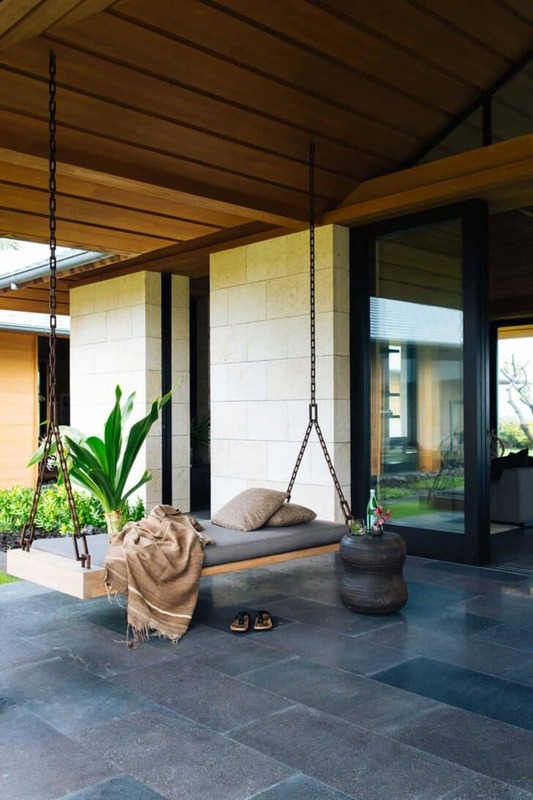 Peaceful Outdoor Daybeds: Asian-Inspired Landscape Design makes for a relaxing place to center yourself after a challenging day. You don't have to make a complicated, busy pattern or an intricate frame to build a peaceful space. This Asian-inspired design relies on the beauty of sturdy, large posts paired up to create large, tree-like designs and beautiful iron hardware. 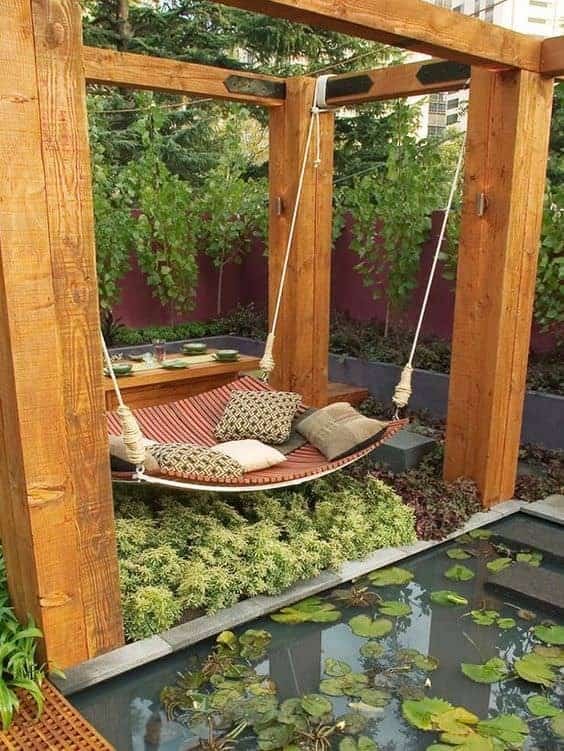 Add a koi pond or just a reflecting pond, succulents, and a swinging hammock, and you have an Asian-inspired oasis! 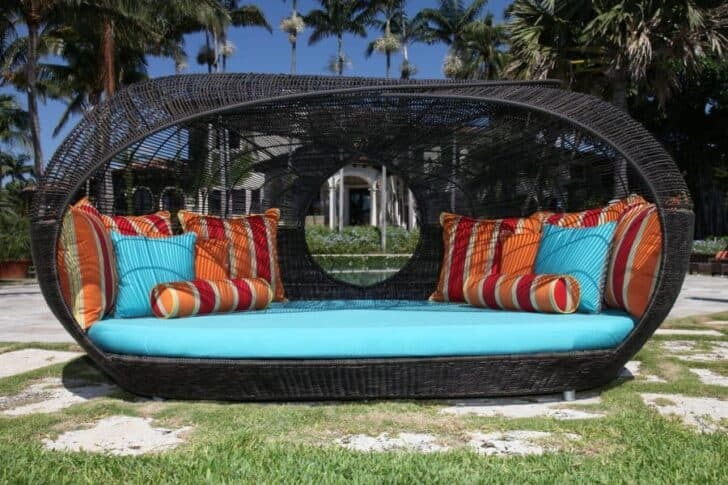 This daybed looks like it should be skimming over a glassy lake with the wind propelling it along. 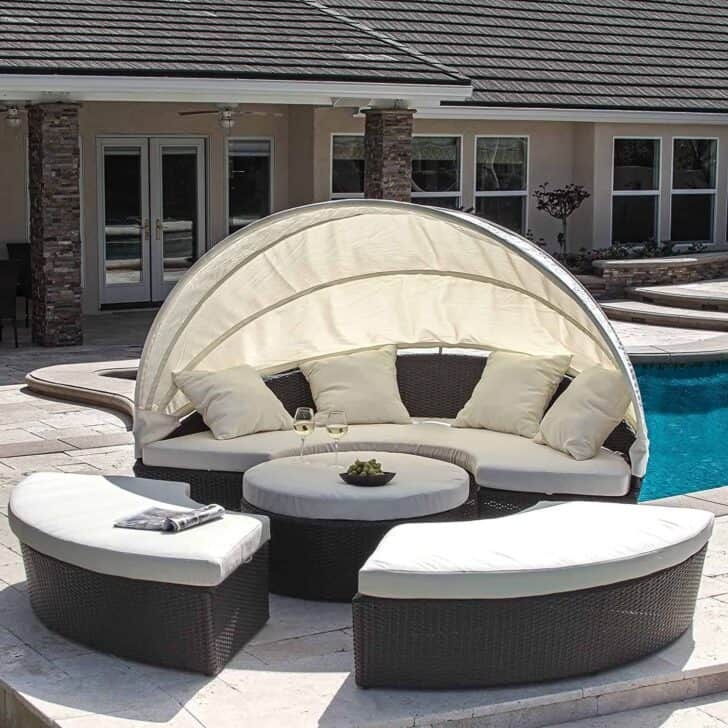 Instead, it graces your backyard, patio or terrace and creates a luxurious, comfortable place to relax. 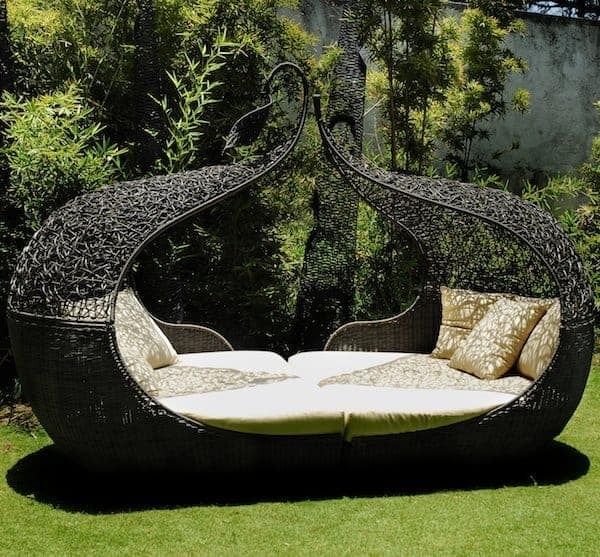 This daybed can be a great place for the family to gather, or if you pull up the shade, a private area for those intimate moments with someone special in your life.